With anticipation I looked forward to the new doomsday movie 2012. This despite the fact that I know the Mayan calendar does not predict doomsday anymore than our calendars do. 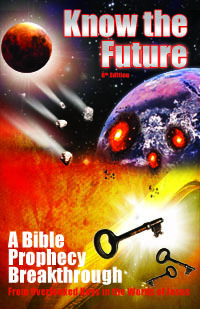 More importantly, as I prove in my book, Bible prophecy does not allow for the world to end in 2012. However, I love a good disaster movie and I appreciate the visuals they provide that make the predictions of Bible prophecy easier to imagine and understand. 2012 does not disappoint in this regard and I recommend all Bible prophecy students take a look at it. My appreciation for a good cinematic destruction of the earth was not always there. For example, when the movies Deep Impact and Armageddon came out in 1998, I confess that I ignored them like most moviegoers did. Although today as an expert on end time Bible prophecy I have an affinity for disaster movies, until recently I just paid attention to the reviews. The consensus of which said that these movies were disappointing or even laughable. However, that year I was too busy for even most great movies. That was the year we had our second child. We moved across country so I could take a new job programming Bible software. I also learned shocking things on shortwave radio that changed my life forever. This included a new theory on who Mystery Babylon was in Bible prophecy (the USA). This understanding would play a big part in my departure the next year from the U.S. to Costa Rica, where I reside to this day. Of course, it was in Costa Rica where I made my own big breakthroughs on Bible prophecy. Yet, up until then I was still guilty of ignoring certain difficult verses in Revelation that today are very timely in light of the new 2012 movie. Let's look at those verses now and see how they match many of the scenes from the 2012 movie. While the doomsday date 2012 is indeed science fiction, most of the events depicted in the movie will still happen in some future year according to Bible prophecy. The movie therefore provides a good way to teach about it and show what the future holds in a dramatic way. This is naturally a very important issue that will affect all of us still living at that time. I went to see 2012 a few nights ago and did not regret it. It truly is the "mother of all disaster movies" given its state-of-the-art effects and 2½ hour running time. 2012 even imagines the destruction of the earth from an entirely new source. Not from global warming as the last movie of director, the Day After Tomorrow, did in 2004. Nor was it from the typical impact from outer space like Deep Impact or Armageddon dramatized. Instead, the concept is that neutrinos from massive solar flares act as microwaves to heat up the earth's core. This causes the earth's crust to become unstable. Crustal displacement then leads to a chain of disasters you could probably easily predict. They range from earthquakes to volcanoes and to something you probably would not predict. There is plenty of action and excitement as the main characters make their way through the disintegration of the ground and structures around them. The scene showing the cliché of “California sliding into the sea” was simply awesome and must be seen to be believed. It no longer seems like a cliché anymore to me. Even better was the eruption of the Yellowstone Caldera. It starts with a bulging of the earth there, then lava geysers shooting up, and finally the whole area explodes into a gigantic orange and black mushroom cloud. In the rest of this article we will cover each disaster depicted in the movie and show you where the Bible predicts the same thing for the end times we may be living through. 2012: In the movie, only a few leading scientists understand how the vicious solar eruptions are heating up the earth and report it to the governments. The governments purposely cover it up to prevent pandemonium long enough in order to make and complete preparations needed to save civilization (not all of humanity, of course). When surface fractures and earthquakes begin in California, people riot, panic and run for their lives. Bible: The destruction begins with signs in the heavens and shaking on earth. This tips people off to what is coming. Their response is revealing. The indication from this account is that people were not warned and preparations were not made for them. Otherwise they would not be running into caves. Instead, they would be seeking underground facilities or bunkers prepared for them. Truly not a situation you want to find yourself in without God's help. God's people will already be gathered to safety before the first signs of trouble begin. 2012: The movie depicts fractures appearing everywhere on the earth's surface. Severe global earthquakes follow and finally a pole shift that causes the north pole to migrate to Wyoming. The continents are displaced laterally and raised and lowered. Bible: The Bible describes the end times beginning the same way at the 6th seal. Both kinds of events earthquakes and a pole shift happen. First there is a massive global earthquake that shifts all land masses. Revelation 6:12-17 — Then I saw Him open the sixth seal. A violent earthquake occurred; the sun turned black like sackcloth made of goat hair; the entire moon became like blood; 13 the stars of heaven fell to the earth as a fig tree drops its unripe figs when shaken by a high wind; 14 the sky separated like a scroll being rolled up; and every mountain and island was moved from its place. Next there is the implication of a pole shift. Revelation is often not direct and clear in describing all events. What we have is angels holding back massive destructive winds until God's messenger evangelists are sealed. The pole shift theory describes massive winds just like this as a result of a sudden change in the earth's pole. These would be deadly, so the 144,000 are sealed with protection from them. Unlike the rest of the saints who have by now traveled to a sheltered place, their mission is to spread throughout the world and warn them of what is coming through Wormwood: destruction, the fall of Babylon, the Mark of the Beast and Great Tribulation. The change of topography in 2012 is predicted in Revelation. This comes four years after Wormwood, during God's wrath and right before the Second Coming of Christ. Revelation 16:18-20 — There were flashes of lightning and rumblings of thunder. And a severe earthquake occurred like no other since man has been on the earth—so great was the quake.19 The great city split into three parts, and the cities of the nations fell. Babylon the Great was remembered in God’s presence; He gave her the cup filled with the wine of His fierce anger. 20 Every island fled, and the mountains disappeared. 2012: The volcanoes erupt next. The Yellowstone National Park caldera explodes, sending a pyroclastic surge upward and outward. This darkened the skies in the movie. Bible: The Bible predicts darkened skies as well at the 4th trumpet and by implication also much vulcanism. Revelation 8:12 — The fourth angel blew his trumpet, and a third of the sun was struck, a third of the moon, and a third of the stars, so that a third of them were darkened. A third of the day was without light, and the night as well. The cause of this darkening of the skies is not directly stated, but it is easy to deduce. Just as in the movie, impacts and volcanic eruptions that the great earthquakes produce would together throw much ash and particulate into the atmosphere. The nuclear winter effect that Carl Sagan predicted would cool the earth. While the Bible does not directly describe volcanic eruptions, it is hard to imagine that after the earthquakes and asteroid impacts that volcanic activity would not be triggered. There is an interesting confirmation of this in a dream from David Booth, the only man who has a successful precognitive vision on record (of an airline disaster in 1979 that he warned the FAA of in advance). David Booth had another vision in March, 2003. From a vantage point in space he looked down on the earth. He saw a dark, planetary object coming towards the southern Hemisphere. This planetary object came past earth inside the orbit of the moon. As it passed he saw the western end of the U.S. blow up with fire and blasts of smoke and ash. From there, the whole earth rippled. The Yellowstone National Park Caldera had blown up. Of course, this dream is not Scripture and we should not treat it as such (a mistake that many Christians make with reported dreams and “words”). However, it does accurately reflect many points that Bible prophecy teaches us about the coming of Wormwood to devastate the earth. This includes the approach from the South Pole rather than across the ecliptic where most bodies in our solar system travel. 2012: In the movie, the volcanic eruptions send rocks shooting into the air which impact the earth. Bible: The Bible predicts a series of meteor and meteorite showers to be followed by an asteroid impact in the ocean. As mentioned earlier volcanic eruptions can be counted on as well to send rocks flying, just as in the movie. Revelation 8:7 — The first angel blew his trumpet, and hail and fire, mixed with blood, were hurled to the earth. So a third of the earth was burned up, a third of the trees were burned up, and all the green grass was burned up. Revelation 8:8-9—The second angel blew his trumpet, and something like a great mountain ablaze with fire was hurled into the sea. So a third of the sea became blood, 9 a third of the living creatures in the sea died, and a third of the ships were destroyed. Four years later when Jesus is about to return, even worse rocky precipitation is predicted. Revelation 16:21 —Enormous hailstones, each weighing about 100 pounds, fell from the sky on people, and they blasphemed God for the plague of hail because that plague was extremely severe. During this 7th Bowl judgment all of God's people will be safe on earth just as the Israelites were during the Ten Plagues on Egypt. Just think about the devastation on the entire earth from these meteorites and the fires they start? As glorified saints in the Millennium, we will definitely have our work cut out for us in reconstruction of civilization. 2012: Megatsunami impacts along every coast line on the Earth, flooding the entire planet. Bible: The asteroid impact of the 3rd Trumpet will cause tsunamis, megatsunamis and coastal flooding. Revelation 8:8-9 —The second angel blew his trumpet, and something like a great mountain ablaze with fire was hurled into the sea. So a third of the sea became blood, 9 a third of the living creatures in the sea died, and a third of the ships were destroyed. In this regard, the movie Deep Impact is closer to Bible prophecy. It does a fantastic job of depicting what it would be like if an asteroid (broken off a comet) would hit the ocean. The megatsunami it unleashes reaches hundreds of miles inland. It even shows people running to the mountains to escape the tsunamis just as Revelation 6 describes happening. Several verses in the Bible indicate that God's people will be gathered to a high elevation mountain city to be safe when this happens. By the way, the global flooding of the 2012 movie is one thing that end times Bible prophecy not only does not depict but actually contradicts. As any child knows from Sunday School, in the story of Noah and the flood God promised to never flood the earth again. The rainbow was given as a sign of this promise. Therefore, the global flood depicted in the movie is Scripturally impossible. While the 2012 movie is based on a false premise, it still provides an opportunity to learn some true aspects of Bible prophecy. This is needed because very few believers are taught Bible prophecy in their church nor do they have much interest in it. This is a shame since prophecy was given to all of God's servants to warn them and comes with the promise of blessings attached (Rev 1:1-3). Part of the blessings that God had in mind when he gave us these controversial parts of the Bible are simple. They interest people in his word and provide an additional powerful motivation to seek him. However, reading the Bible and books like mine can only go so far in conveying the magnitude of the fearful disasters coming. The visuals in a disaster movie are a gift then because they can go so much farther. Therefore I believe as a Bible prophecy fan you owe it to yourself to see 2012. It can help you to put your present concerns and cares of the world into proper perspective and get back to what is important: your relationship with God. 2 Peter 3:10-11, 14 — But the day of the Lord will come like a thief. On that day the heavens will disappear with a roaring sound, the elements will be destroyed by fire, and the earth and everything done on it will be exposed. 11 Since all these things are to be destroyed in this way, it is clear what sort of people you should be in holy conduct and godliness 14 So then, dear friends, since you are looking forward to this, make every effort to have him find you without spot or fault and at peace. This advice is nothing new. It is the same way of conducting our lives that Jesus instructed. It merely represents another reason to do so. Knowing your life may come to a premature end in a way that few expect can give you an urgency to seek God that you might not otherwise have. In this way, taking the time to see 2012 with the understanding that it depicts real events you may live through in some future year may help you to walk more uprightly. Pray to God afterwards about helping you to be accounted worthy to escape all these things as Jesus instructed (Lk 21:36). Tim: Just a comment on the movie 2012: I decided to go to it to see if it was biblical. i agree with you that it was. I live in a small town and the movie theatre is a little small one and when one goes to matinee there may be only 2-3 other people in the theatre. This date I went to a matinee and there was actually a LINE waiting to get in (that never happens here) and the movie theatre was packed, many of them Christians who I heard discussing this movie while standing in line. They came to see if it was biblical. I have to admit that when I walked out of the theatre, i was disoriented the movie was so powerful. i also agree that the flood at the end and the so called "arcs" was not biblical and this will not happen this time. however, as you say, it was so powerfully depicted as to the coming disasters it left me sort of breathless. I have since discussed the movie with others,some who are in denial "God would not do such a thing" to which I always reply "Oh, really? Watch Him. He will beat you half to death to get you on your knees to save your soul if He has to so yes, he will do this and he will do even more so get your head out of the sand." I see that the Almighty is using this movie (He will use anything at His disposal) to wake people up though mich of it was not biblical, the disasters certainly were. I plan on gonig to see it again. I talked to my grand daughter about it and she is back reading her bible and taking her little son to Sunday School. So, yes, it has scared people and that is exactly its purpose. To scare people and get them on their knees. See the follow up post to this article on if the 2012 movie takes God's name in vain. You can comment on this 2012 article at my blog.